Seated at his desk in the presidential palace, Hamid Karzai occasionally rubs his legs. They still ache from the time he hiked through the mountains of Afghanistan, dodging the Taliban, as he tried to gauge his popularity. But such aches and pains are nothing, he says, compared to what Afghanistan has gone through in the past year, as it struggled to rebuild the wreckage of more than two decades of war. For the 8,000 U.S. soldiers deployed in Afghanistan, 2002 has been a year of settling into grim daily routine after the heady days of driving out the Taliban. Their main focus remains on hunting down Osama bin Laden and his supporters. But in recent months the U.S. administration has turned its attention to reconstruction. More U.S. military and civil engineers are heading out to Afghanistan. Their mission will be to rebuild the roads to unite a divided country. For Karzai, the 45-year-old compromise leader who took office in December 2001 and in June was elected unanimously to run the country for the next 18 months, much of 2002 has been spent trying to heal ethnic divisions, getting a grip on powerful warlords and their private armies, and surviving assassination plots. But his National Army, supposedly critical to uniting the country, has not yet begun to take shape. The police are pitifully under-trained and international money to rebuild Karzai's shattered homeland is barely trickling in. Last month, four Kabul University students were killed during protests demanding food and electricity. Karzai couldn't sleep that night. Instead, he fasted and called the dead students' families to console them. 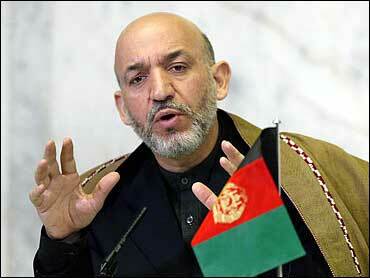 "Just the basics is all they wanted," Karzai said in a recent interview with The Associated Press. The police had the equipment: helmets, riot shields, tear gas; but not the skill or courage to quell the crowd without opening fire on it, he said. Kabul has become increasingly insecure this year with more attacks, including a major one on Sept. 5 that killed 30 Afghans. In February, the aviation minister was assassinated. The vice president became the next victim in July. And, in September, Karzai himself narrowly escaped a gunman who opened fire on his car in Kandahar, the former Taliban stronghold. U.S. Special Forces guarding Karzai killed his would-be assassins. No arrests have been made in the other attacks. Still, it annoys Karzai to read media reports that his control does not stretch beyond the city limits of the capital, Kabul. "It's become a cliche for the Western media," he said. "I've stopped reading them. They don't take a deep look at my country. It's all superficial." Karzai says that, "if I give an order it is carried out." Yet he seems to concede that the problem is a weak bureaucracy. "After 23 years we don't have any administration either in Kabul or in the provinces. This is what we have to build, to develop." But it wasn't all bad news in 2002. Many women, who in Taliban times were cooped up at home and forced to cover themselves in burqas, returned to work. Children went back to school. The United Nations expected 800,000 war refugees to go home. The real number turned out to be 1.8 million. During Taliban rule, Kabul people got around on bicycles. Now a traffic jam can stretch for three blocks. New businesses, including Chinese, Italian and Afghan restaurants, are opening. Foreign aid workers barely numbered 100 under the Taliban. Now there are 2,000 in Kabul alone. In fact, Karzai says he wishes more money would be spent helping needy Afghans than paying aid workers. The inflation-blitzed currency has been brought back to earth by lopping off zeros to establish an exchange rate of 43 Afghanis to the dollar and killing off three other kinds of bank notes issued at various times by different warlords. Karzai is an urbane, Western-educated Afghan in traditional tunic and baggy pants. He is a man as comfortable in tribal tents as in diplomatic corridors. But critics and well-wishers alike worry that he is not coming across as being very strong and decisive. They argue that quarreling warlords still control the regions, threatening stability, even drawing U.S. Special Forces into their centuries-old feuds. As a member of the majority Pashtun community, Karzai has a strong political base. But the Defense Ministry is dominated by ethnic Tajiks, the group that led the Northern Alliance to victory over the Taliban in 2001, and little has changed in 2002. The international accord that set up Karzai's government said all Afghan military men were to leave Kabul before the first peacekeeper arrived in Afghanistan. Today 4,800 peacekeepers from 19 countries are in the capital. But the Tajik soldiers, largely loyal to Defense Minister Mohammed Fahim, are also still in town. Fahim's sizable weapons stocks have yet to be handed over to the National Army. Karzai and most Afghans would like to see the peacekeepers fan out beyond Kabul, but the United Nations has voted against that. The United States and France are training recruits for the National Army, but Fahim's Defense Ministry provides them. Most are in their mid-30s and are loyal to one warlord or another. Until there's a proper army whose sole loyalty is to the state, the country remains vulnerable to the kind of tribal wars that have torn Afghanistan apart since the Soviet occupying army withdrew in 1989. Despite having one of their own for president, many Pashtuns fear they are being punished because the Taliban regime also was mostly Pashtun. Karzai says the notion of an ethnically divided Afghanistan is a Western media creation. Most Afghans agree, saying they don't personally hate people from different groups. However, they do complain that the most important ministries are those run by Northern Alliance loyalists. Meanwhile, international donors say $1.8 billion has poured into Afghanistan in the last year, but Afghan officials are skeptical. "When we heard this it was a shock to the government, to the people, even to the U.N.," said Yusuf Pashtun, the housing minister. Pashtun said only $80 million reached the government. The rest went to administrative costs and emergency aid, but very little went into reconstruction, he said. The United States has pledged more than $3 billion in aid, and while it is still busy hunting al-Qaida and Taliban fighters, it is increasingly involved in reconstruction.